Receive a full session from Reiki Master Teacher, Lumié. Receive a Refresher Attunement to your current level. Give a full session and ask questions. Do Hatsurei-ho together and resolve your quesitons. (Optional) Practice some of the Usui traditional techniques, review some specific ways and exercise. Who should take Refresher Attunements? 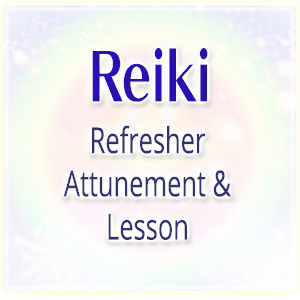 Every Reiki practitioner can benefit from the refresher attunement to keep the Reiki channel fresh and clear. It’s especially effective if you haven’t been practicing much since you attended a class. Also it’s great to receive for harmonizing your clearing phase, and to prepare yourself before taking the next Reiki level if you took your current level a while ago (to lessen the drastic shift to your body). The one-on-one review lesson is a cost-effective and very practical way with a chance to give and receive a full session. It is effective to receive Reiki regularly besides doing self-Reiki after being attuned to Reiki especially when you are going through a drastic cleansing period. All Reiki practitioners of all levels are welcome.